WinADayCasino’s new five-wheel roulette game, Roulette 5, has been so popular since it launched in April that the popular slots and video poker site has added another new Roulette game to its online casino games room. The new La Roulette has a “low bet” option that can give players more bang for le buck. La Roulette is like Roulette 5 but since it is played by European Roulette rules, there is no double-zero like in American Roulette. Having only one zero gives a slight edge to players since each spin has a 1 in 37 chance of landing on any one number rather than 1 in 38. With La Roulette’s new low betting option, players can place bets as low as $.10. On any spin, they can bet on one, two, three, four or all five wheels. Until recently WinADayCasino.com offered only slots and video poker games. Since adding Roulette and Keno the online casino has noticed that its players sometimes like a change of pace. 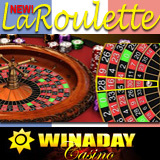 To encourage players to try the new La Roulette, WinADayCasino is making two special offers. All players that play 10 or more rounds on La Roulette between August 19th and 25th will be automatically entered in a free bonus draw. Five randomly chosen players will each receive a $200 bonus and another five will each receive $100. WinADayCasino.com wants to know what players think about the new game and is asking them to send their feedback on La Roulette to support@winadaycasino.com. The best five testimonials will also each receive $75 in their account. This month WinADayCasino’s Game of the Month is the Vegas Mania slot machine. Everyone that plays it is automatically entered in a monthly draw for $500 in prize money and a chance to win a Dell Studio 15 laptop in a year-end draw.